The trees are nearly bare, most of the leaves in windswept piles against the shrubbery and there is a chill in the air. I’m eager to decorate my home and continue our humble family traditions. Just a few days ago, I found myself compiling an ambitious list of DIY decor projects I’d love to complete in time for the holidays. The one that most caught my eye is a paper bead garland to wrap around the Christmas tree. I’ve always thought it was necessary to have a dedicated craft room to do my projects in since I have twin boys and a toddler who thwart my creative efforts nearly every time I sit down to do something for myself. I imagine an oasis-like space where I can work in uninterrupted swaths of time—complete with a big beautiful door that protects everything until I came back. Pure fantasy. In reality, my children need constant supervision, and it’s not possible to close myself off in a room all day to indulge my creativity in making paper beads. I often have an urge to do something creative with my hands, to connect with the artistic part of myself that too often sits in the dusty recesses of life due to the season I’m in. Because I can’t have a dedicated room for my projects, I’ve searched my home for alternative workspace solutions. In the process, I’ve found I can accomplish a lot more than I thought when I approach the challenge with ingenuity. Working Creatively Over the years, I’ve used all kinds of non-standard spaces to accomplish the work I’ve wanted to do. I’ve never had a dedicated desk. When I was young, I did my homework at the dining table so I could ask my mother questions as she prepared dinner. In high school and college, I preferred to do my homework on my bedroom floor. Spreading out all the pages and having open books around made me feel that I could access everything I needed at any time. I would study curled up in a non-ergonomic ball because it felt comfortable and peaceful. Working in non-standard spaces has become part of who I am. I stand at my bar height counter during the day to pay bills. I snuggle into my sofa with my laptop and reference books to work on writing projects while my kids have quiet time in their room. I utilize baby gates to corral my kids while I spread out important documents to organize and file on the living room floor. And here I am back at the dining table again as an adult with all the elements needed for my latest creative pursuit. I roll paper beads with a sense of satisfaction in my ability to indulge my creative desires in the real home in which I live, not the ideal space I dream about. That brings me joy. My creativity is rejuvenated not only by doing something artful with my hands but in my ability to resolve this problem creatively. You don’t need a designated room or even a desk to have a functional, comfortable, and delightful workspace. You can cultivate an efficient, non-standard workspace anywhere that will suit your home and lifestyle if you consider the following principles. 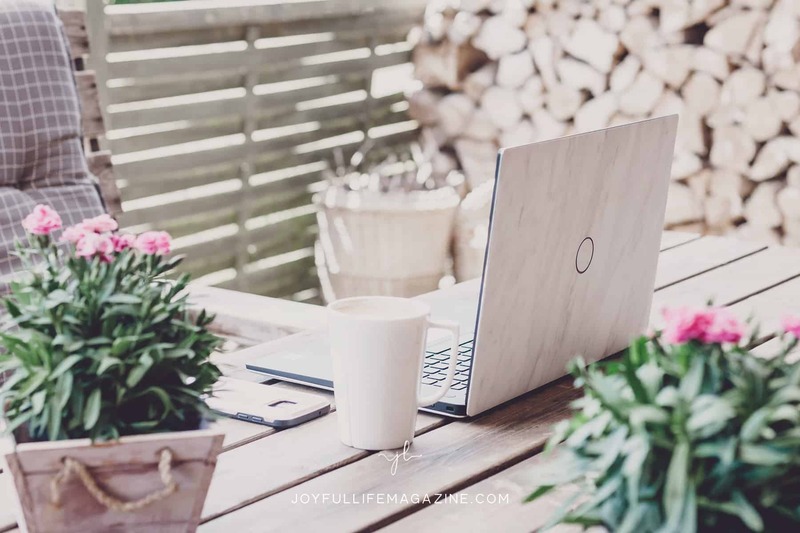 You can cultivate an efficient, non-standard workspace anywhere that will suit your home and lifestyle if you consider the following principles. Dedicate a space. Intentionally devote an area of your home for a specific amount of time to accomplish a desired goal. Maybe it’s your room, the couch, the dining table, or a counter in your kitchen. Wherever you choose, let that space be set apart for the time and purpose of your project and when you are finished or when your time is up, put things away and move on. Make a plan in advance. Before you begin your task, gather all of the supplies you will need to do the job and bring them to your dedicated space. You will be more efficient with your time if you are not running all over the house to get the things you need in the middle of your work time. If you are paying bills at your kitchen counter grab your checkbook, stamps, pens, and stapler before you begin. Mind the clutter. When you start to work in a space free of extraneous items, it conveys a sense of possibility—like a blank canvas does for a painter. Nothing is more distracting than trying to focus with a bunch of random stuff scattered on your work surface. Clearing mental clutter is just as crucial to being efficient with your time as working in a tidy space. If your mind is on other things, take a few minutes to jot down anything taking up mental space so you can come back to them later. Anything that is not contributing to achieving your work goal will hold you back and produce anxiety and avoidance. There will always be something to accomplish and you can’t always do projects in an ideal environment, but that doesn’t mean you can’t do something. If the majority of your life does not happen behind closed doors, why should your inspirational space be locked behind one? Why can’t your creative space be the same space you spend the majority of your time? Get things done in a way that fits your life and brings you joy. Perhaps you will find the more you embrace an unconventional workspace, the more joy and creativity might flow. Get things done in a way that fits your life and brings you joy. Very beautiful post. I like your outlook on it. When my girls were all young I had my sewing machine squeezed into a tiny space in my laundry room and did all other crafts on the dining room table or living room floor. Now that they’re all grown I have a dedicated studio in my home and I love it! Although right now I have a project on the living room floor and bits of one spread out on my table … I suppose it just works! Thanks for sharing.